All our mechanical and electronic digital door locks are shipped with ‘everything you need in the box’ to fit them (except for the tools of course). 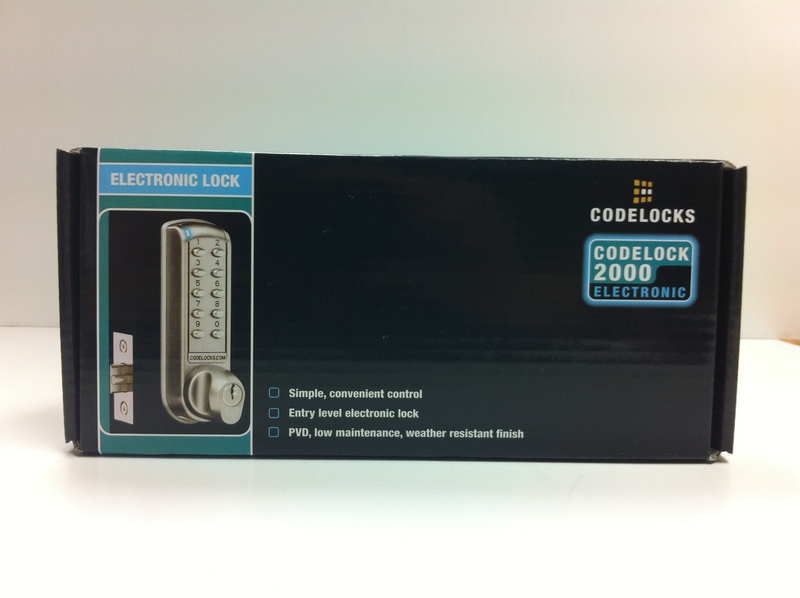 So let’s imagine you’ve just bought a brand new coded door lock and it’s arrived in a little box just like the one below. As well as all the parts, there is a list of the tools you’ll need in order to fit the lock, a fixing template, comprehensive fixing instructions and a programming guide. We’d recommend that you check you’ve received all the parts and then test the lock to make sure it works. If you need spares, you can contact our technical support team and they’ll send you replacements. To test the digital lock, first remove the battery cover from the back plate and install the batteries supplied. Connect the cables from the front to the battery pack. A beep should be heard when you do this. If it doesn’t beep, then check the batteries are correctly installed. Now enter the factory set master code by pressing 1234. A blue light will flash and the front knob should turn. This indicates that the lock is working properly and you can begin to fit the lock to the door. Before installing it, we’d highly recommend that you read the instructions through and familiarise yourself with all the parts. If you’ve bought an electronic door lock to replace an existing mechanical lock, then we’d also recommend you watch our video clip that shows you how to upgrade the lock. By following the step-by-step instructions you should have a new electronic keypad lock working in less than 20 minutes (if you are upgrading a mechanical lock to an electronic one). If you need help at any point during the installation, then our technical support team is on hand to talk you through the steps. Once your lock is on the door and working, you need to reprogramme the factory set master code. Choose a code with 4, 5 or 6 digits. The length of the master code will determine the length of the sub-master and user codes. For example, if you choose a six-digit master code, the user codes will also be six-digits long. Press the codelocks.com badge bar, this is the # prefix and puts the lock into programming mode. Then enter the factory set master code, 1234, the blue LED should flash. Enter ‘10’ for programme 10. The blue LED should flash again. Enter the length of the master code followed by the code you have chosen, for example ‘5’ to indicate that your code will contain 5 digits, and then the master code you want, such as 98765. Wait for one flash of the blue LED light and then enter the same thing again to confirm the new master code (5, 98765). The blue LED light will flash twice indicating that the new master code of 98765 is set. Again, the Codelocks technical support team is on hand to help with programming issues. You can contact them on 0800 393405. Once the code lock is on the door and fully programmed you can enjoy years of standalone access control all from one little box.